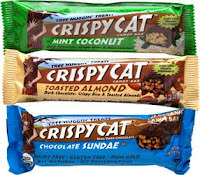 One of my favorite indulgences (if not my most favorite) right now is Crispy Cat Organic Bars. These are so very yummy, and although they are not the lowest calorie snack around, they are not too horribly high in calories, either. And if you’re going to indulge, there’s no healthier candy bar on the market. In fact, this is the world’s first and best organic candy bar. If you’re trying to lose weight, strictly staying away from sweets will only make you want them more! Luckily, these delicious creations will eradicate those yearnings for something ooey-gooey-good. Granted, there are other ‘vegan’ candy bars on the market, but many of them have a weird, unnatural flavor to them. These are more like the calorie, fat, and dairy laden candy bars that you probably long for from time to time – only they are not sweetened with high fructose corn syrup – but organic brown rice syrup. 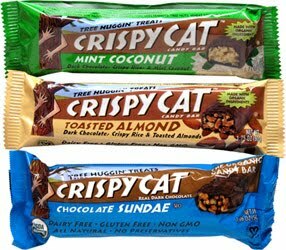 So which Crispy Cat flavor rules supreme? Wow, that’s a hard question because honestly, they are all super good. There are three flavors to choose from. Chocolate sundae is decadent, tasting just like the ice cream that you probably had as a kid with marshmallow cream and dark chocolate fudge-like flavoring (200 calories, 6 fat grams, 2 grams of fiber, 4 weight watchers points). Then there’s mint coconut (and you know me, I’ve been really into coconut lately). Mint coconut is sort of like a cross between a peppermint patty and a coconut candy bar and for my personal tastes, it is the best of the three. It’s nothing short of heavenly (210 calories, 8 fat grams, 2 grams of fiber, 2 weight watchers points). And then last but not least is toasted almond, crammed full of chocolate flavor and toasted almonds (200 calories, 7 fat grams, 2 grams fiber, 2 weight watchers points). Toasted almond is only 95% organic, the other two choices are 100% USDA certified organic – all are 100% delicious and sure to cure that sweet-tooth craving. All are cholesterol, gluten and dairy free, too. I buy them at Whole Foods (in the organic food aisle, not the bar aisle), and they are also available at the Yummy Diet Food Store. If you are interested in some lower calorie but equally yummy bars check out my previous posting on low calorie bars. 200 cal is pretty low and I am with you on all things COCONUT! You should do a review on all things coconut: ice cream, bars etc! The most amazing coconut flavored thing I've had was this toasted coconut ice cream from an old fashion "Ice Cream Shoppe" when I was about 12 yrs old; I still dream about it! So good! Nutrition-wise, these really do look good for 170-200 calories per bar, but are they really worth $2 per bar? Yeah, forgot to mention how pricey. I just buy one per week. I love them that much but not enough to eat them every day. re: the price...anything organic is going to cost more. it's just the way things are right now, unfortunately. if you want quality ingredients, you gotta pay for them.